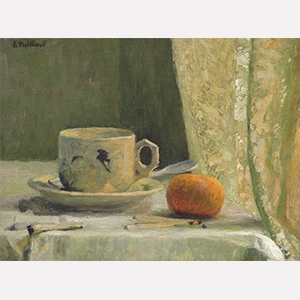 Édouard Vuillard was born at Cuiseaux, Sâone-et-Loire, France, the son of a retired military officer. In 1877, the family moved to Paris, where he attended the École des Beaux-Arts and the Académie Julian. He befriended Pierre Bonnard, Maurice Denis and Paul Sérusier, with whom he founded the Nabis in 1889 (the name derived from the Hebrew word for ‘prophet’). Influenced by Impressionism, Symbolism, and Japanese woodblock prints, the group focused on pattern and ornament, and embraced decoration as painting’s primary function, often challenging the boundaries between fine arts and crafts. Together with Bonnard, Sérusier, and Toulouse-Lautrec, Vuillard created several set designs and costumes for theater productions. 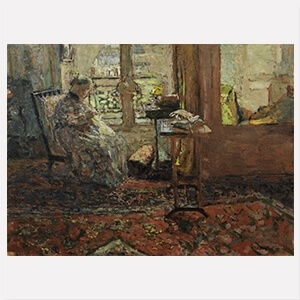 By the turn of the century, Vuillard returned to a more naturalistic painting style and after the end of World War I, he focused mainly on portraiture. He formed a close friendship with the art dealer Jos Hessel and his wife Lucy. This personal and professional partnership lasted until the artist’s death in La Baule, Brittany, in June 1940.